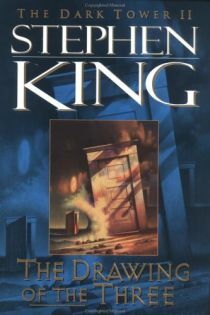 The Drawing of the Three is the second book in Stephen King's The Dark Tower series. The Man in Black is dead, and Roland is about to be hurled into 20th-century America, occupying the mind of a man running cocaine on the New York/Bermuda shuttle. A brilliant work of dark fantasy inspired by Browning's romantic poem, "Childe Roland to the Dark Tower Came". The Drawing of the Three is Roland's journey to (and through) three different doorways to another time and place. I learned in book 1 that you never can guess what's going to happen with this series. This remains true throughout Drawing of the Three - from Roland's injuries on the beach to the experiences that lie behind each doorway. In this quest, we meet the unforgettable characters that will accompany Roland on his quest for the Dark Tower. The ka-tet. So far this is my favorite of The Dark Tower books. Are you a Dark Tower fan? I'm on the 5th book and i actually found this book, the second one, to be the most tedious and boring. The first was more interesting. Keep up with the series though, it's a good one so far!